any tour company or agency. Once again, this is just KISS fans, helping other KISS fans. to clarify and/or check for updates. You want to see KISS in Japan, you get to see KISS in Japan!!! Members of the KISS Army Australia will be traveling to Japan in force to witness the exciting new KISS production with the 'spider stage' live! - KAA designer Keith Tarrier has lived in Japan on and off for 15 years since 1990. He has been in Tokyo for 14 years. Keith has gracitiously offered his time and knowledge to help other KAA fans get to Tokyo and have rockin' good time while they are there. 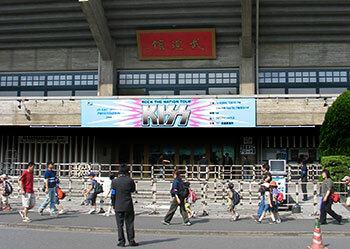 KISS sign at the Budokan 2004 tour. 3 Kinds Of Ticket Packages at the Official JAPAN KISS Army Website. ■ULTIMATE Meet & Greet Package（Meet KISS！Great Seats！Merch ! Accoustic Performance）- 99,800 YEN. - Most people may fly into Narita Airport. It is about 80km from central Tokyo. DO NOT TAKE A TAXI! It will cost you about $300! - I personally find the buses to be best. Airport Limosine, with a big orange and white sign in the arrivals hall, has buses that go to all major locations and hotels in Tokyo. About 2500 yen. - There are a lot of hotels and accomodations options in Japan to suit almost all budgets. - For a nice, clean (but small) friendly business hotel, I recommend the Toyoko-Inn chain of hotels. My ageing parents have even stayed there a few times. They are all built in the last few years and there are so many of them in major cities. They don't have pools or room service etc. You get a clean room with private bathroom, TV. How do I get around Tokyo? - The subway system is probably the best way, as it covers all the major areas and criss crosses Tokyo. It is cheap and you can buy a charge pass you can load up with credit and just swipe it as you go through the ticket gates. - Downside is it is below ground mostly, so you don't get a the real view of Tokyo, suburbs, houses, roads etc. - Try stay clear of the rush hour if you can. *Note: You sit in the back of a taxi, not the front seat unless you have 4 people. They have automatic doors to open and close. What can I eat in Tokyo? - Many cheap to reasnoable priced restaurants will have a picture menu and/or platic food in the window. It is very helpful, and if you don't know what something is... just try it! - Food prices vary from very cheap, to very expensive. There are hundreds of fast food places, espeically near the station entrances. McDonalds, KFC and more. - Convinience stores also offer a wide variety of food options. Pre-made 'bento box' lunches and dinners, rice balls, snacks, drinks and alcohol, plus toiletries and other usefull things. - Yes, Tokyo is an Asian country and it is different to Australia but it is not that different. It is a major, very clean, modern city, with generally friendly and kind people. - Many people do speak English to some degree, don't be afraid to ask simply questions. - If you can, get a global roaming plan for data on your smartphone. Use Google maps or such, and google translate. I never had these for most of my time in Japan, but I know they would have made life much easier if I did when I first arrived. Wi-fi coverage is getting better in Japan, but a lot of it is not free, it is tied to the major phone companies. - If you have a plan with a reasonable SMS/text or date rate, then it will also be easier for KAA members to keep in touch while in Japan. - Have a look at the travel websites and official tourist infomration guides etc. Ask your friends and familly if they have been to Tokyo. ROCK AND ROLL ALL NITE AND PARTY EVERY DAY!! - I fly from Japan to Australia at least twice a year. - There are only a few direct flights from Oz to Japan. From Sydney to Tokyo you have JAL/Qantas code share. These (usually) leave about 8 or 9pm in the evening. Arrive about 6a.m. at Narita Airport. This is great if you want to leave Friday night and catch KISS on Saturday night. Allows a lot of time for delays and a lot of time to find your hotel if you get lost! - Jetstar also fly to Japan from many Aussie cities via the Gold Coast and/or Cairns, to Narita Airport. Most flights are day time flights, leaving the Gold Coast in the morning at either 8 or 10 a.m.
Great if you have kids who cant sleep on a plane over night, but you need to arrive a day earlier if you want to see KISS on Saturday night. I have had Jetstar cancel and or change my flights between Japan and Australia, so be careful if time is a consideration or travelling with kids. - Other airlines fly to Tokyo via Hong Kong, Taiwan, Korea, Singapore and more. You may also get a flight into Haneda Airport, which is closer to Tokyo.